Anyone with young children knows that going out for a family dinner can sometimes be a Herculean task. But it doesn’t have to be that way. 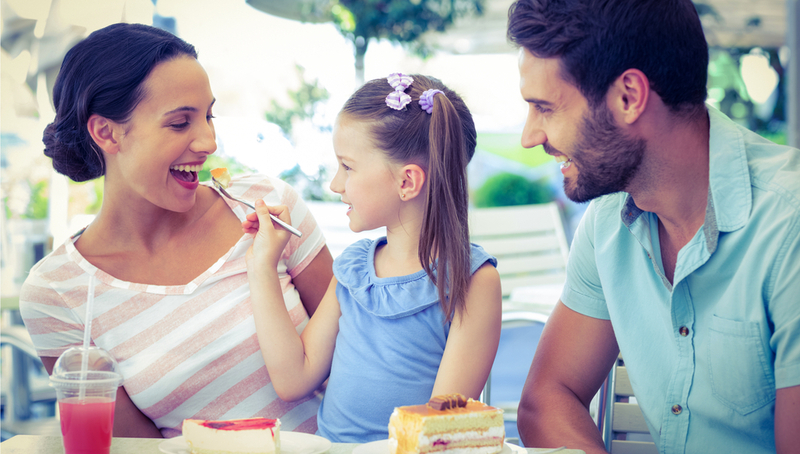 An enjoyable dinner with the kids is possible, provided you think ahead, plan carefully and follow a few simple rules. Stick to casual restaurants that welcome children, where it’s not too quiet and the atmosphere is friendly. Check the menu online to ensure there are children’s options, and make sure your kids will be interested in at least a couple of those choices. If you’re bringing toddlers or older babies, ask about high chairs and preferably book one in advance. A food court is a great option as high-chairs are usually in plentiful supply, everyone in the family can choose a different option – and it won’t break the bank. Children get hungry, tired and cranky quickly, especially when they’re out of their comfort zone. Eating early means the kids get fed before “hanger” sets in and they’re not too tired to enjoy themselves. Additionally, it’s usually less busy earlier, so your kids aren’t as likely to be annoying other diners. Kids get restless and, if they’re stuck at a table waiting for food, they’ll be even more whingey. Make sure you bring colouring paper and pencils, puzzles, books and child-friendly technology if you think that’s appropriate. On the other hand, you could leave all technology at home, and think of dinner as a family affair rather than a night out with your spouse… kids in tow. Engage your children and get them to join in the conversation. They’ll be less likely to get bored or use attention-seeking behaviour, they’ll learn how to eat out respectfully and you’ll all enjoy some important family-bonding time. You need to get to the point of the night – food – fairly quickly. Go straight to mains and request that all meals be served at the same time, along with any drinks. If you plan to buy the kids dessert, you can time your coffee accordingly. Although it’s easy to spend an entire night out worrying about mess, decibels and chaos, if you’ve chosen a suitable restaurant and your kids are reasonably well-behaved, chances are a little bit of noise or a spilt drink won’t even be noticed by people around you. So try to relax and, most of all, enjoy time with your family.